mikepasini.com | Photo Corners | It's 2013! There's no avoiding the years at a magazine. Almost every page that isn't an ad has one somewhere, starting with the cover. And the boss's little reminder -- always with an exclamation point -- placed right where we'd all see it every few minutes, saved all of us more than a few times from living in the past. It's a different world now. You check your smartphone for the time. And where the year does appear (like on our footer just below), a smart little piece of code figures it out so nobody has to remember to update it. Our little note may be mainly nostalgic but another little ritual around here is worth recommending. It has to do with our cameras. Oh, the camera clock knows the year all right. No problem there. But we use the Comment area in our Nikons to add a copyright notice to the Exif header of each image. No image leaves our camera without a copyright notice. If you do the same (and it's not a bad idea), take a moment to confirm you've got the right year. 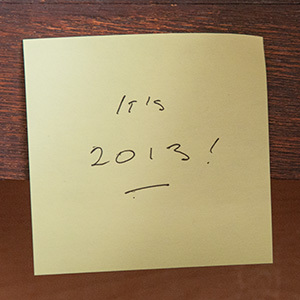 As it says on this Post-it note here, "It's 2013!"